Also, I've uploaded an early playable demo onto itch.io. Please head there and download the demo, which is either for PC or Mac, and see what you think. Finally, I'm going to start updating my new devlog on the tigsource forums. Please head there for more granular updates about the game's development. Are Retro Sports Games Better Than Modern Sports Games? I've got back into retro gaming in a big way after buying a framemeister. Me and a friend have been heavily playing Super Tennis on the SNES, amongst other games, and this got me thinking about the idea that retro sports games are (generally) much better than modern sports games. I'm trying not to be nostalgic here. I think it very easy to fall into old codger mindset that 'things were better in my day' but I genuinely believe this to be true. There are plenty of reasons why I think this, including the fact that retro sports games usually have simpler controls, more iconic representation and a larger focus on the single screen multiplayer experience but I think that it comes down to the simple fact that modern sports titles have an endless obsession with realism. I think the pursuit of realism is one of the most detrimental forces in MODERN game design. I've also never really understood the motivation behind our industries obsession with it. Ok, I get the idea that some people want graphics to look as close to real-life as possible, and it is a laudable goal which I admire (even if it doesn't float my boat) but I never fully bought into the idea that the game design itself should also pursue this goal. A retro sports classic. Super Tennis! To paraphrase Roger Caillois games are separate and closed off from real life. Unlike life, the very best games are simple, clean, easy to understand. You know who was the winner, you understood everything that took place and can easily comprehend exactly why it had that outcome. So I do find it so perplexing that some designers insist on putting these opaque rules inside the game to better simulate stress levels, concentration or fatigue. I mean, what does the "vision" stat actually do in Fifa 15? I go back and play EA Hockey, Irem Skins Golf or Super Tennis and there is an elegant simplicity to the gameplay that makes for a wholly more satisfying experience. I think this is one of the main reasons that Rocket League is getting so much attention. It taps into that more simple retro sports game design philosophy (that and it was free to PlayStation Plus subscribers!). The game becomes about players pitting against each other real-time competition where the only difference between them is their dexterity and skill. This is an argument that I've had many MANY times with friends when talking about Fifa Soccer (or why I don't like playing football games any more). I can easily understand why a company like EA would push for more and more realism, but why is it that, on the whole, this is the only type of sports game available? There are realistic and unrealistic racing games, realistic and unrealistic first person shooters and realistic and unrealistic third person action games in the triple a space and yet the only unrealistic sports game of note in the last ten years (that isn't some sort of future sport) is Wii Sports! Wii Sports Tennis. Good, but its no Super Tennis! It is interesting that Wii Sports is also the second best selling video game of all time. So perhaps there is a market for a unrealistic football game after all..? It seems like I've finished the basics of the my random dungeon generator for Salvage. 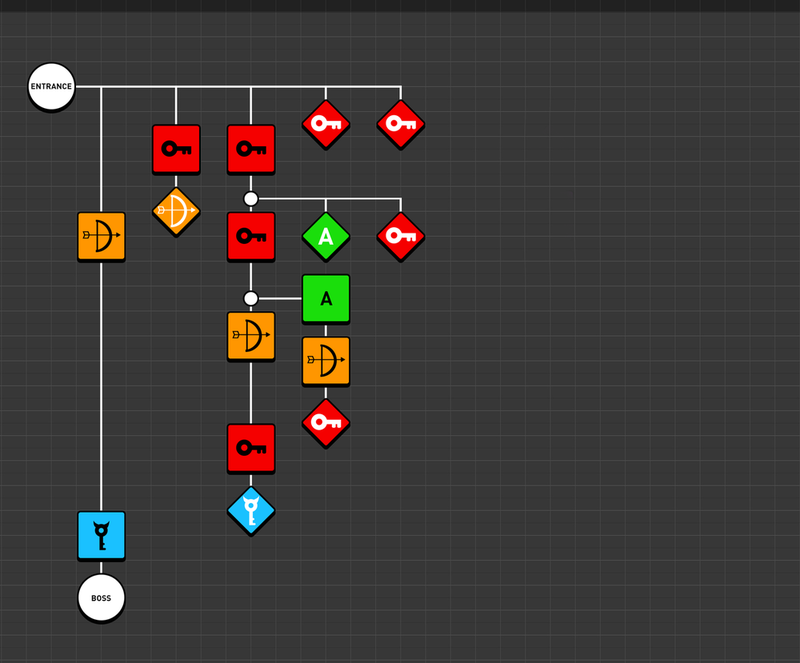 The system is super simple but it gives me the sort of control I want out of a spaceship level generation system. As I've covered in more detail in my game design document, the levels are created using 9 x 9 tile sets which are created by hand, that are then translated into tile props unity game objects when generating the level. Here is a sample tile set script. (The 'W's are the wall tiles, the 'F's are floor tiles, the 'P' is a patrol point for the AI system). The prefab tile sets that are hand crafted in script is a very similar system to the Spelunky method of randomly generating the world, but this system use the drilling method to cut a path to the exit because the system might cut into outer space! I've only made a handful of ship layouts (and will probably make a few more before release) but already each of which give me a generated dungeon layout in the silhouette design that I wanted. This is the Freighter layout (above) which is currently my favourite. As you can see, the large main body is separated from the two parallel "engine" tile sets, connected with corridor tiles. This is the Shuttle layout. It is smaller, and has double wing tips that will have weapons mounted on them. (Each layout with have a ship outline that will be hand drawn by an artists, when I managed to find one, which will help sell the idea that it is a ship). Also, those tiny black squares are actually crates which are laid down as the ship is build. These warship layouts also show the region system I have implemented. Each part of the craft is given a region number, or code, which the AI use when patrolling, so they stick to their area and don't just wander the entire ship. "An affordance is often taken as a relation between an object or an environment and an organism, that affords the opportunity for that organism to perform an action. For example, a knob affords twisting, and perhaps pushing, while a cord affords pulling. As a relation, an affordance exhibits the possibility of some action, and is not a property of either an organism or its environment alone." In Mario the player quickly learns the main verbs that the chubby plumber can perform (i.e. jumping and running), from initial experimentation with the controls. When looking at spiny for the first time, the spikes placed on the enemy turtle's back informs the player that the base strategy of jumping onto an enemy's head to squash them won't work for this opponent. This elegant principle is very powerful but rarely actually consciously discussed by development teams when making games (in my experience). I think this is partly due to the fact that making games from well established genres come with certain assumptions about how the player's avatar, opponents and environment will behave. Also (dare I say it?) I think there is a certain amount of reluctance to admit that a piece of art actually has more of a role to play than just to look nice. The player's understanding of how the game's rules function can only be built from playing the game (yes, the player could build a better model by reading the instruction manual, but who actually reads instruction manuals any more) so games have to be careful about what they are saying to the player at all times and not supply misinformation that could cause frustration. "To engage in activity directed towards bringing about a specific state of affairs, using only means permitted by rules, where the rules prohibit more efficient in favour of less efficient means." 'Less efficient means' is the important part of that quote in the context of this conversation. The easiest way to win at golf would be to carry the ball and place it in the little hole using our hands, not to walk 500 yards in the opposite direction and attempt to get it in only using long metal sticks. We instinctively understand that if winning at the game is trivial then it becomes boring. So, as designers, we deliberately put rules in place to make achieving the goal of the game more difficult using these 'less efficient means'. But I think that designers can get 'trying to communicate the rules of the game clearly' and 'creating an interesting challenge for the player to overcome' mixed up and start to obscure how the game's rules work in order to create challenge, which I think is a mistake. (Lets be clear, I mean rules and not information. Hiding information about the game's state is a completely valid design technique, with hidden playing cards in a poker game and a strategy game's 'fog of war' being two great examples of this). It's a fantastic mod that adds meaningful additions like the ability to aim vertically and reload. (There are other actions, including a "duck" and "jump" which I have chosen to ignore because they weren't considered when designing the levels) These changes, along with much nicer lighting and some of the most violent and over-the-top gory game permanence (that even puts Hotline Miami to shame) makes this version easily the definitive version of Doom. The most interest part of this mod is that it actually makes Doom's core gameplay even better. Most pc mods either add graphical enhancements, streamline UI elements, or add new gameplay features, but very few (with the exception of minecraft) revise the core gameplay to such a degree as this. The Brutal mod improves moving, aiming and shooting, adding kickback to the shotgun and reloading to the plasma rifle. Also although reloading and head-shots are a staple of modern fps design, I still find it fascinating that these gameplay elements enhance an older game which was never designed to include them. DOOM is one of the best first person shooters of all time, I mean, it goes without saying. But one of the key strengths of the game that seems either downplayed or downright ignored by modern game design trends is that its completely abstract with the enemy design. Each monster type serves a gameplay purpose first and foremost. What I find most interesting is that nearly all modern first person shooter studios do not design the game working from these simple principles. Why not? Haven't we already seem enough humanoids carrying semi-automatic weapons? Anyway, download the mod here. Remember to buy the game first. Have you ever played Space Hulk: Vengeance of the Blood Angles? It was a great squad based first person shooter which I owned (and still own) on the 3DO, a CD based console from the mid nineties. This is the cover art for Space Hulk: Vengeance of the Blood Angels. The cover art copyright is believed to belong to Electronic Arts. The game was similar to the board game of the same name, but played out in real-time. The player controlled any single solider, from a first person perspective, and would have to pause the game to give orders to other squad members or change which space marine they controlled. The thing was, this "pause" was actually a limited resource. Time drained away as you frantically scrambled to assign everyone an order before the genestealers started moving on your position again. I always loved this idea (and the game in general) and thought the game was ripe for a re-imagining on a new platform. So, this was the basic idea for my new game when I first started working on the idea sometime last year. Take the core gameplay of Space Hulk, where you control all squad members by pausing the game and assigning them orders, and mix it with modern rogue-likes like Spelunky or Nuclear Throne. The game is now more Paradroid than Space Hulk. You now play a robot that can hack other robots. I've ditched the pausing time mechanic, and controlling other squad members. This is one of the luxuries that I can now afford working for myself. I can change the ideas as I see fit without huge repercussions. I can also remain startlingly ambiguous about certain features, because I just don't need to design them yet. Working as a lead designer on a big project at a big studio in the games industry you kinda have to know all of the answers, or at least come off like you know all the answers, without knowing any of the answers. Making interactive software is always risky and the outcome of any game's design is always unknown. Being able to predict the outcome of a mix of different real-time gameplay systems is like trying to predict when it is going to rain. It becomes very complex very quickly. This is one of the main reasons why innovation is quite scarce in big budget development: It's harder to predict. So, with my new game I'm trying something a little different. I'm trying to be more flexible about the game design. I am going to make a bit of the game, then play it to see what it's like, and then make a bit more. Hopefully this methodology will make it easier to react to change, and to double down on the bits of the game that actually work. Whether this development model is successful or not will be documented on this website, I guess.